A handful of chopped basil. Divide 150g roquette, watercress and spinach salad between two large plates. Cut 1 small, ripe avocado into 1cm-thick slices and arrange on the plates. In a large bowl, whisk 50ml extra virgin olive oil with the juice and grated zest of 1 large mandarin, 1 tsp sea salt, 1 tsp freshly ground black pepper, 1 tbsp clear honey, 1 pinch ground ginger and a handful of chopped basil. 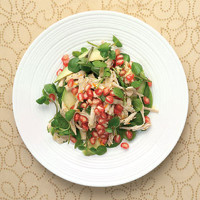 Toss 150g cooked white turkey meat in the dressing, then arrange the dressed turkey over the salad leaves. Top with the seeds of 1 fresh pomegranate and serve immediately.